Rain fell in Swiftwater as the Stroudsburg Marching Band played the pre-game ceremony. Once kickoff ensued, the action was fast and furious. 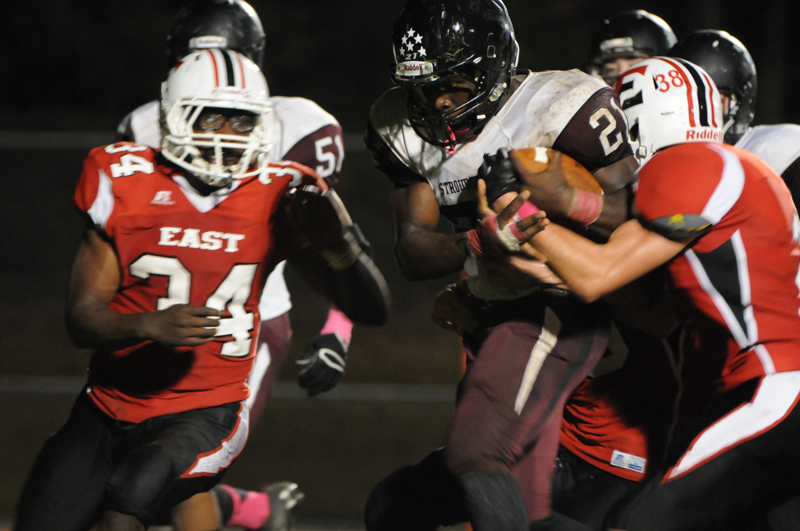 Stroudsburg struck first, but Pocono Mountain East answered back in record time. 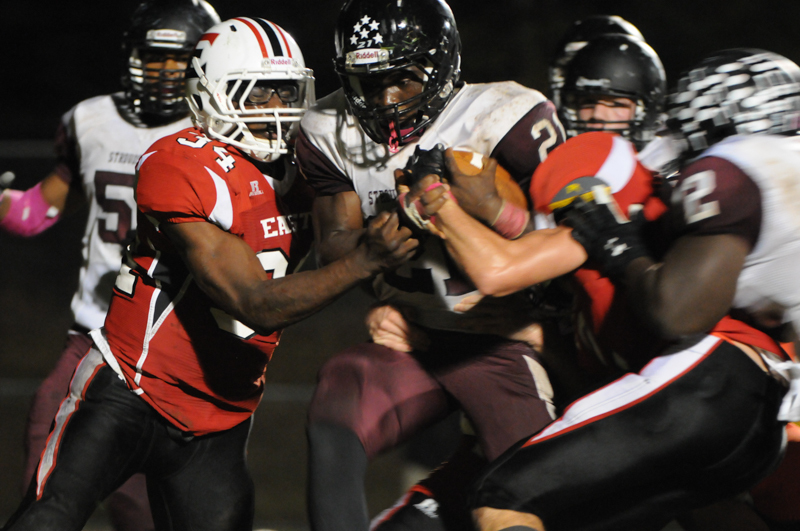 The game was tied 7-7 late into the second quarter, but Pocono Mountain East was driving and knocking on the door. The Cardinals punched it into the end zone with less than 30 seconds remaining in the first half. Stroudsburg received the kickoff but could not drive the ball before the half ended. The second half was a different game for Stroudsburg. Rushing and throwing seemed to come a bit more naturally, but an early muffed punt resulted in a turnover and a quick touchdown. Stroudsburg scored another follow-up touchdown to make it 28-14. The Cardinals made it interesting by scoring a touchdown very late in the game but their on-sides kick was recovered by the Mounties who hung on to win 28-21. These two photographs of #21 Gerald Douglas crossing the goal line with the go-ahead touchdown are online at the Pocono Record. You can view the article here. This Friday night’s football game, featuring Lehighton at Pocono Mountain East, included some aerial attacks down field from the quarterbacks. Some amazing acrobatic action ensued! Many fans enjoy and prefer the passing game. It’s exciting to see a quarterback drop back behind the line of scrimmage and toss a throw to a sprinting receiving. 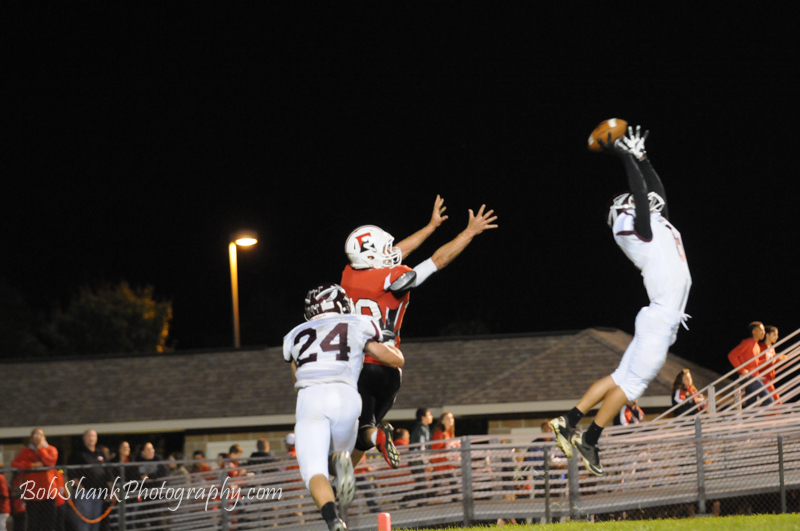 It’s even more awesome when the receiver makes an acrobatic catch! This night had it all: throws, incomplete passes, receptions, and interceptions. What is not to like about all this? I am passionate about sports photography and I live for this challenge to capture the action in the air! My next game is tomorrow night and I can’t wait to have a crack at it again!